Family-owned Jordan Wine Estate, situated in Stellenbosch, South Africa, the heart of the Cape Winelands, has been transformed to become one of the leading estates in South Africa. Featuring a wine tasting centre, luxury accommodation, a delicatessen-style bakery and a world-class restaurant where visitors can relax and enjoy fine Cape wines and local Cape fare surrounded by breath-taking views of the vineyards. Jordan Wine Estate boasts spectacular panoramic views of Table Mountain, False Bay and the Stellenbosch Mountains. 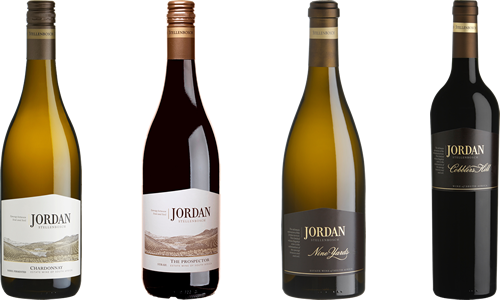 Gary and Kathy Jordan have been making award-winning wines since 1993 on their 164 hectare hillside property with a grape growing history going back over 330 years. Unique by nature’s design, the Jordan slopes face North (where Cabernet Sauvignon excels), South (where Sauvignon Blanc competes with the best in the world), East (where Chardonnay produces Burgundian-like white wines) and West (where the Syrah vineyards enjoy the afternoon sun and gravelly soils). The ancient soils have evolved from 600 million year old Cape granite and range from deep, well-drained clay-loam to gravelly and sandy soils situated on clay. Vineyard elevations are between 150 and 395 meters above sea level.